B0980. Léon Melchissédec. 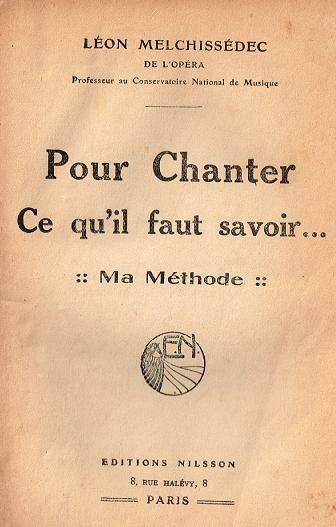 Pour chanter ce qu'il faut savoir - Ma Méthode. Paris, Nilsson, 1913. 242pp. (French Text) Softbound. Contents all intact, albeit mended spine; covers stained and darkened with small chips; pages yellowed. Most worthy of rebinding. 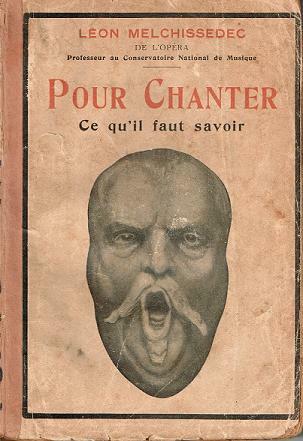 “Léon Melchissédec was a French baritone who enjoyed a long career in the French capital across a broad range of operatic genres, and later made some recordings and also taught at the Paris Conservatoire. Melchissédec played second violin in the Théâtre de Saint-Étienne before coming to Paris to study. After classes with Alkan, Puget, Mocker and Levasseur at the Paris Conservatoire, where he won a first prize in 1865, he made his début at the Paris Opéra-Comique on 16 July 1866 in Cohen's JOSÉ MARIA. Remaining at the Opéra-Comique until 1877, Melchissédec’s repertoire included LES ABSENTS, LE PREMIER JOUR DE BONHEUR, LALLA-ROUKH, ROBINSON CRUSOÉ, LES DRAGONS DE VILLARS, LE PRÉ AUX CLERCS, FANTASIO, MIREILLE, RICHARD CŒUR DE LION and LE CAÏD. In 1873 he became the first true baritone to sing the title role of ZAMPA (as opposed to a singer of mixed voice). Melchissédec moved next to the Théâtre-Lyrique, singing in DIMITRI, LE CAPITAINE FRACASSE and the premieres of PAUL ET VIRGINIE and LE TIMBRE D’ARGENT. In 1879 he joined the Paris Opéra, making his début as Nevers in LES HUGUENOTS on 17 November 1879. His repertoire there included GUILLAUME TELL, L'AFRICAINE, LA FAVORITE, RIGOLETTO, FAUST, and he created roles in LE TRIBUT DE ZAMORA, TABARIN and LE CID. Having sang Capulet in the first performance of ROMÉO ET JULIETTE at the Opéra-Comique in 1873, he sang Mercutio when it transferred to the repertory of the Opéra.